The Mountain of Fire and Miracles Ministries Church, popularly called MFM, has denied that eight Nigerians arrested by Cambodian authorities for alleged drug trafficking are its members. Eight Nigerians were on Tuesday arraigned in Cambodia for allegedly using the MFM premises to deal in illicit drugs. 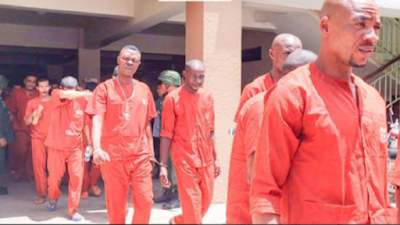 The accused were: Nnamezie Victor, 30; Francis Nnamdi, 30; Sunday Nwabuisi, 31; Tony Mmaduka Chukwuonye, 34; Okorom Kizito, 35; Favour Nnabuife Okorom, 36; Maduka Simon Ukandu, 37; and Izuchukwu Chukwuma, 40. Also charged along with them is a Cambodian, Mon Vinyong, 25. They may face life imprisonment if found guilty by the Phnom Penh Municipal Court, in a case that began in January last year.A verdict is expected in September following a final trial last week. Reacting to the claim that the Cambodian branch of the church was used to trade in drugs, Chairman of MFM Media Committee Worldwide, Oladele Bank-Olemoh, said the accused were not members of the church. He said linking the accused to the church was an attempt to drag the name of the church through the mud. “The MFM church is not shut down. Our pastor is there and he’s busy in the ministry. Those arrested are not members of the church. They are neither our missionaries nor workers in the church. The MFM church is the only African church in Cambodia that many black people attend. “You know the country is a Muslim country. This could be a vendetta against the church. This case (of alleged drug trafficking) happened in 2014. The church was searched and nothing was found, though arrests were made outside the church. We employed a lawyer to prove the church’s innocence,” Bank-Olemoh said.